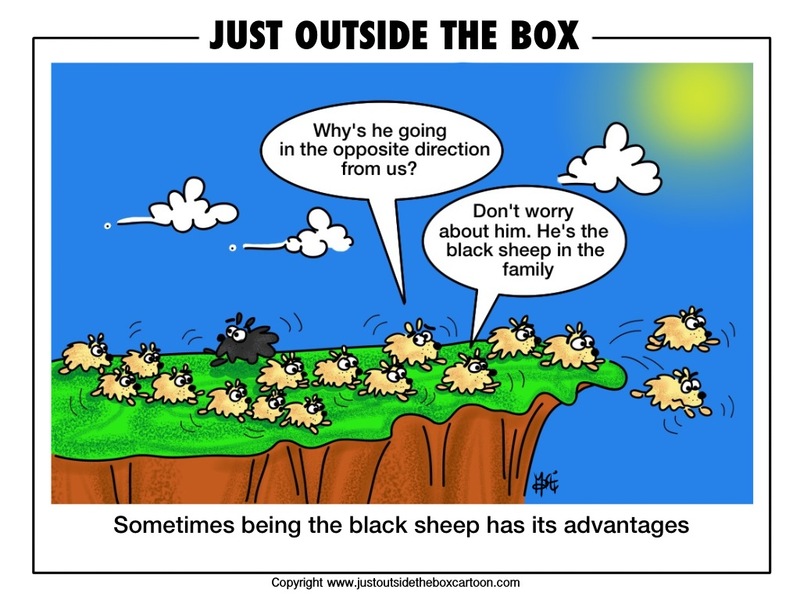 “Black Sheep Lemming” reprinted with permission of Just Outside the Box. There is no real cliff. The only cliff is the one created by the imagination of the lemmings now running toward it. There never has been a real fiscal cliff. The likelihood is that “the cliff” will disappear before the lemmings reach the brink. If the lemmings that created their cliff don’t all become “black sheep”, they’ll all be in big trouble with their constituents back home. Maybe the partisan brinksmanship will end up serving a different purpose. If it does, it may turn out to have been one of those “teaching moments” when the light bulb goes on among the students in the classroom. The United States of America is a representative democratic republic that places the art of compromise for the sake of the common good at the center of the nation’s life. If the perception of a “fiscal cliff” calls the electorate back from the precipice created by ”one-issue, my-way-or-the-highway, lemming politics“, the cliff that never was will turn out to have had the good effect of a new civility. This entry was posted in America, Life, Politics, Uncategorized and tagged black sheep, civility, fiscal cliff, Just Outside the Box, lemmings, no fiscal cliff, representative democracy, teaching moments, the art of compromise by Gordon C. Stewart. Bookmark the permalink. It’s so difficult to do what you have done here. Nice job. Robert, I can always count on you to make my day. Thank you so much. Happy New Year!